Japanese chemical industry giant Toray has teamed up with light-weight car designed extraordinaire Gordon Murray to create the T-Wave AR1, a concept EV two-seater to demonstrate the extreme weight savings possible with Toray’s carbon fiber composites. The concept T-Wave AR1 announce September 9th in Japan can get up to 147 KM/H and has a range of 185KM. Although it is a concept car, the existing design could be homologated for road use. The use of carbon fiber for the frame as well as more typical parts, such as exterior body panels and seats, keeps the weight down to a feather-weight 846KG. Apparently the design can be adapted to become a four-seater, which would only add 129KG. 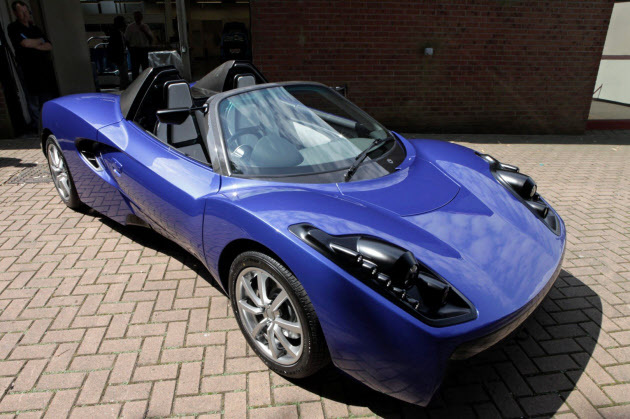 To put this in perspective, the Tesla Roadster, another 2-seat EV, tips the scales at 2690 pounds, which is 1,220KG – a massive 44% more than the T-Wave AR1. The car body is said to be 2/3 of the weight of its steel counterpart, which shows that the majority of the weight savings are in replacing the heavy steel frame, as you would expect. Not only that, but the use of carbon fiber in the frame makes it 10 times stronger than the steel equivalent. It also absorbs 2.5 more energy in a collision, so if you think this car’s diminutive size will make it dangerous in a collision, think again. Of course, the major reason that carbon fiber is not seen in wide-spread commercial application currently is the sheer cost of production: VW’s experience with their XL-1 diesel-electric hybrid suggests that extensive use of this light-weight material would increase production costs by 20 times over the steel equivalent. The T-Wave is no exception, with the cost of developing this one prototype put at 300 million Yen (3.88 million dollars). Despite this Toray Vice-President Chiaki Tanaka was upbeat about expanding the use of carbon fiber in automotive applications: ” We want to see supply [of carbon fiber advanced materials] not just to high-end luxury cars, but to everyday vehicles as well.” Toray’s aim is to see this happening in earnest from around 2015. The cost obstacle would seem to be a difficult one to surmount, but with the innovative Mr. Murray as your partner, it perhaps does not seem as difficult. The T-Wave is the star of the show at the Toray Advanced Materials Symposium at the Tokyo International Forum from 14 to 15 September, 2011.